If the rollout of legal recreational marijuana goes (more or less) smoothly this week, an Ottawa-based tech firm will be able to claim at least some of the credit. Canadian cannabis-fanciers are expected to log on in large numbers to buy the product online after it becomes officially legal one minute after midnight tonight. In four provinces, that online shopping experience will be shaped largely by a single company: Canadian e-commerce giant Shopify. The company was chosen to design the retail platform for online sales in Ontario, British Columbia, Prince Edward Island and Newfoundland and Labrador. Shopify's Vice-President and General Manager Loren Padelford laughed when asked whether he thinks he's joining the marijuana trade this week. "We're not the seller of the products," he said. "We're the facilitator of the technology. We give people the platform to sell whatever they want, as long as that's legal." Padelford points out that Shopify isn't in the business of selling marijuana — any more than it's in the business of selling clothing, or spa services, or any of the thousands of products now sold online using the company's e-commerce platform. Shopify's Vice-President and General Manager Loren Padelford: "We give people the platform to sell whatever they want, as long as that's legal." All the other elements of the online sales system appear to be in place. Distribution centres across the country are ready to go. In Ontario, for example, pallets of dried cannabis are stacked floor to ceiling in warehouses that look like home renovation stores. Even those who file their orders online at a minute past midnight will have to wait at least a few days for them to be filled and delivered. There is no same-day delivery. "That's a function of online sales in a lot of ways," said Padelford. "You've got to buy it first and it's got to get shipped to you." One potential wrench in the gears could be Canada Post itself: its workers are in the midst of contract negotiations and in a legal position to call a strike with 72 hours' notice. Mike Palecek, national president of the Canadian Union of Postal Workers, said the delivery of legal recreational cannabis by mail could be delayed as a result. "There is the potential that these negotiations will impact all mail delivery," Palecek told CBC News. "Canada Post has been struggling lately with a massive increase in parcels, not just from cannabis, but of course from the shift from retail to online shopping. "We've seen exponential growth in parcels and that is causing a whole number of questions that playing out at the bargaining table right now." Palacek said Canada Post is quite ready for recreational cannabis delivery and isn't expecting problems. "We've been delivering medical cannabis for years already. This is a service we already provide. "We are used to delivering parcels with age verification, with signature required, with all of these things, so we really don't expect to see anything different." The union, however, said it does expect to see an overall spike in the number of parcels being delivered by mail as the online recreational cannabis market ramps up. Canada Post spokesperson Phil Legault told CBC the carrier had continued to refine its approach to marijuana delivery since it first started carrying the medicinal product. "Awareness and training for our people has been ongoing across the country in the lead-up to October 17," Legault said. Shopify has been preparing for October 17 in its own way. The company has been working with medical cannabis for a few years, but "this lead up to cannabis legalization has been really going full tilt for about a year," Padelford said. 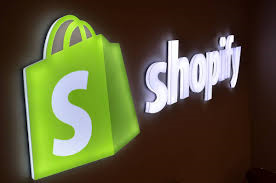 Padelford added he is confident Shopify's tech is robust enough to handle the volume. "In combination with our data security and safety, our ability to handle large volumes is one of the things that makes Shopify so special ... we've been prepping our whole lives to handle large volumes of sales." Padelford acknowledges that Shopify probably will have more work to do on the online shopping experience after October 17. "Legalization is a process, not a single day," he said.